I started with the local Washington cashmere blended batts I made last week. Creamy naturally colored wool, local soft brown cashmere with darker guard hairs, thrums, and organic light brown organic cotton- I think I forgot to mention the cotton before. 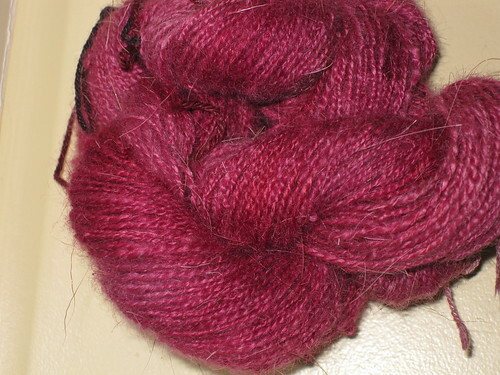 It adds some nice speckles of color in addition to the naturally dyed thrums in the yarn. I spun it up in to a fine sock weight 2 ply yarn. Slightly overtwisted before blocking, the way I like my sock yarns- the tight plies and extra twist helps keep it strong. About 350 yards of yarn when I was done spinning. 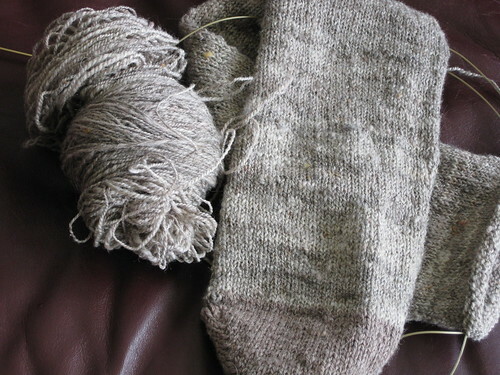 Then I made the heel and toe yarn. I wanted a 3 ply in something that didn't have much cashmere in it for strength reasons. I blended up some naturally dyed soft purple brown wool I dyed with just a touch of the wool cashmere blend the main yarn is made from. Spun it up slightly thinner and navajo plied it since I was only making a small amount of yarn. I ended up with 100 yards of the 3 ply. I am making afterthought socks. While I don't *need* to- 350 yards alone is more than enough yarn for a pair of socks for me, I wanted to be able to demonstrate the technique, since it is a great way to use handspun sock yarn that is slightly uneven since you can work with 2 strands at a time and not worry about weighing. Also good to get the most out of sock yarn for some of the new socks yarns that are out that don't have much yardage. 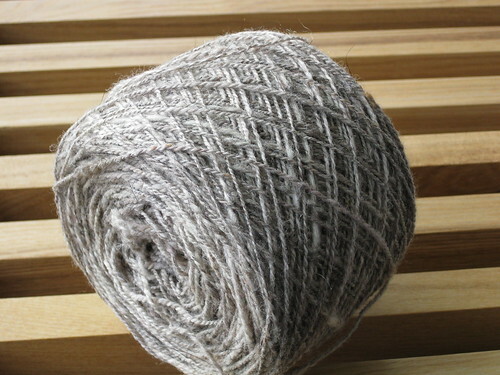 Then I decided I liked spinning the cashmere so much that I would just spin up the rest of the cashmere I had in stock. This was maybe an ounce of cashmere. I ran it through my drum carder 10+ times first to help get some of the VM out, the white cashmere had more VM than the brown. 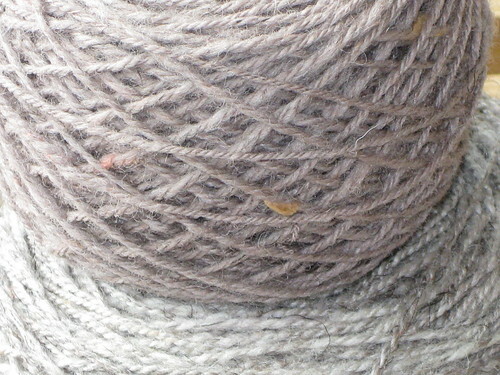 I left the guard hairs in here too- I wanted to see how the white guard hairs would dye compared to the shorter fibers. As you can see, they didn't really dye and produce a nice effect against the dyed cashmere. 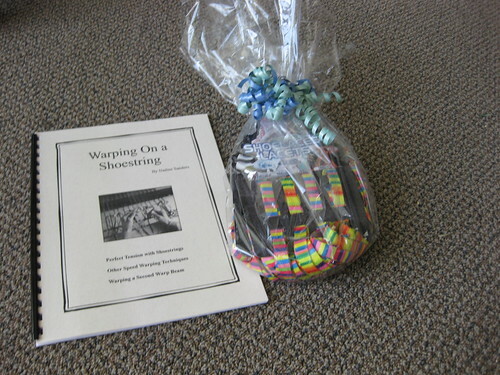 Warping on a shoestring, and shoelaces, brought to me by the person who picked up my other loom. This looks like it will be a great way to quickly tie on without wasting lots of string, which I hate.